So, to work on this aspect, a majority of this session will focus on the transition aspects of the game. 1. Middle blockers work on being disciplined and staying in base – seeing the ball, chasing it down and putting up a solid, well-formed block. 2. Setter works on vision and then trying to fool the middle. If the setter sees the middle take a step one way, she should go the other way with the set. While this is happening, the other players on the court are hitting and digging cooperatively, trying to keep the ball off the floor until the middle blocker has formed 10 good blocks. If the middle reaches 10 before the ball hits the floor, the drill is over. If the ball hits the floor first, the MB goes back to zero. Pepper has taken some knocks in recent years for not being game-like enough. But it has a purpose. As Oregon State Coach Terry Liskevych points out here, it’s no different than soccer players juggling a soccer ball – it’s about developing a good touch with the ball. Watch here as Liskevych narrates a team pepper session, taking players through a progression that becomes increasingly challenging as it moves along. Terry Liskevych, head women's volleyball coach at Oregon State, presents a dig-set progression drill here that focuses on out-of-system defense and transition. To start the drill, a coach marks an “X” just behind the 3-meter line in the middle of the court, then enters a down ball to one of two back-row players. One player digs the ball to the X and the other sets the ball to a player standing at left front. In the next progression, the player at left front becomes an attacker. The drill remains the same, except after the coach enters the down ball, the attacker transitions from the net to the 3-meter line and approaches to hit the set ball. The drill’s final progression is an over-the-net cooperative drill. The drill remains the same, except a right-front attacker is added and players set up on both sides of the net. When the ball is hit over the net, the opposing side digs the ball and repeats the cycle. Joe Sagula, UNC Head Women's Volleyball Coach, finds a ton of value in cooperative drills because players are reliant on each other to reach a common goal. This ideal warm-up drill gets players to work together, puts them in pressure situations,and helps them improve ball control skills. To run the drill, four players set up on both sides: middle back, left back, left front, and right front (a setter who does not rotate). A down or free ball is entered to one side where the team executes a dig, set, and controlled angle swing by the left front player. After the third contact, players rotate. The goal is to get 10 rallies across the net without the ball touching the floor. Penn State Head Women's Volleyball Coach Russ Rose presents this serve pass sequence where players get a lot of good quality repetitions. It's especially helpful for teaching beginning players how to serve and pass to a target. In phase one, a server plays the ball over the net at a passer who gets the ball to target. Phase two progresses into full court serving at three passers. The drill should progress based on skill level of the players. Transition for hitters is the movement between defense (blocking or digging) and offense (attacking). Russ Rose, head coach at Penn State, puts an emphasis on spending a lot of time training transition. In this drill, left side hitters must dig or block a variety of balls, then transition to swing. Next, middle hitters block, then transition and hit from a position where the opposing blocker is not. Coaches at every level use hitter vs. hitter drills to isolate attackers and pressure their performance. Unfortunately, some hitter vs. hitter drills leave non-live hitters disengaged because their attempts don’t matter. Mark Barnard, associate head volleyball coach at Oregon State, solves this problem with his +7 hitter vs. hitter drill. The coach determines which hitters are live (or able to score) each round. A team’s score increases by 1 every time their live hitter gets a kill and decreases by 1 every time any hitter makes an error. If a non-live hitter gets a kill, the score stays the same. The coach starts play by initiating a free ball and alternates free balls until one team reaches a score of +7. Setters have to manage how often they set the live hitters because it's easy to burn them out with too many consecutive attempts. Non-live hitters have to stay low-error to help their team win the round. Penn State women's volleyball coach Russ Rose sends players scrambling in this 6-on-6 drill. He values this drill because it produces a lot of touches and gets players working hard. Using his typical wry delivery, Rose suggests that coaches who like to talk a lot during play should probably consider a different drill. To start the scrambling, teams of 6 take the court and the coach enters a ball “any where, any way and any time he wants.” Rose uses this coach-controlled drill to work on individual weaknesses – like jousting – or team weaknesses like when the setter plays the first ball. Each rally gets played out and the coach alternates balls to each side until a total of 4 have been entered. Players track how many of the four balls were converted, then both teams rotate and the drill resets. The team that wins the serve and pass battle will more than likely win the game. Ideally, teams want to side out at 66.7% and point score at 40% in order to win. Doug Reimer, UBC Head Women's Volleyball Coach, demos two variations to team play that emphasize winning the serve and pass battle. A normal rally score game takes place in the first variation, but an additional score measures server vs passer score. Servers get a point if the passers make a "1" or "0" pass, and passers get a point for a "2" or "3" pass. The two scores are added together and the first team to a certain total score (15 or 30 points) wins. In the second variation, passes get rated on a four point scale, "0", "1", "2", or "3" pass. After the rally is completed, the passing team gets free balls based on the pass scale. For example, if it was a "2" pass, the team gets 2 free balls. Teams alternate serve and regular scoring takes place. Even though our focus is out of system, we don't want to ignore the importance of the serve and pass components. 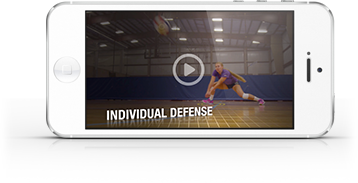 In this drill, you get points for winning the serve pass game. You also get points for winning a rally. So, we are implementing the focus of the practice, along with winning rallies. Since our focus was on out of system efficiency, it would be a good idea to stat and review with the team that portion of the session. What was our attack efficiency when transition attacking. How many times did we go from dig to kill? Video that places focus on transition attack approaches or the quality of sets when out of system would be appropriate.